The Cintiq Pro Engine PC Module from Wacom transforms your Cintiq Pro 24 or 32 into a fully-fledged all-in-one computing solution for creating content. Specs-wise, it's equipped with a 2.5 GHz Intel Core i5-7300HQ quad-core processor, 16GB of DDR4 RAM, and an NVIDIA Quadro P3200 graphics card. For storage, it has a 256GB solid-state drive to quickly boot and load programs. If needed, you can upgrade this module's RAM and SSD for enhanced performance and storage space. 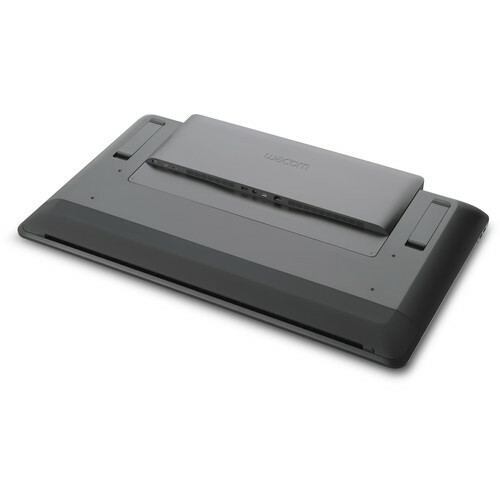 Moreover, by attaching directly into the Cintiq Pro, this module has less cables to deal with to help keep your workplace clutter-free. With the additional processing power, you'll even be able to tackle VR and 3D applications. Other integrated features include 802.11ac Wi-Fi, Gigabit Ethernet, Bluetooth 4.2, USB Type-C, mini-DisplayPort, and HDMI ports. The operating system installed is Windows 10 Pro. After its hiatus during Windows 8, the Start Menu has returned. Utilizing a combination of the traditional menu system and Windows 8's Live Tiles, the improved Start Menu gives you more information at a glance, showing notification information alongside your applications and other pinned items. Microsoft's digital personal assistant, Cortana, can answer your questions with information gleaned from both your device and the internet at large. You can type or even talk with her, if your system has a microphone. Using her Notebook, Cortana keeps track of your needs and wants, and she learns over time to improve her information gathering skills. Box Dimensions (LxWxH) 20.3 x 15.9 x 2.7"